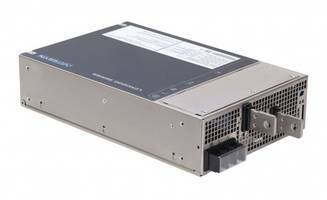 The LCM3000 series from Artesyn Embedded Technologies is an AC-DC single-output enclosed power supply. It can supply up to 3000 watts of output power at configurable nominal outputs of 12, 24, 36 or 48 volts. The power supply is equipped with standard features including power factor correction, smart fan and digital control. The power supply is measured at 11 x 7 x 2.5 inches and offers a power density of 15.7 watts per cubic inch. The LCM3000 series complies with both medical and industry safety approvals and is ideal for use in the communications, computing, consumer electronics, medical, military, aerospace and industrial automation industries.